MedGrade sells and supports MO Disks, MO Drives, CD & DVD printing & disc printing supplies, imaging supplies and optical media that are manufactured specifically for use in critical environments. Our products meet or exceed FDA standards for medical applications. 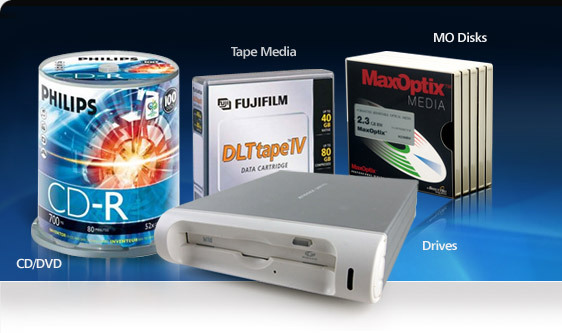 From Magneto Optical Drive Repair to Tape Drive Maintenance, Custom Printed CD & DVD and Disc Duplication; When your storage media matters - we're here to help. Philips 3.5" 640 MB 2048 sector rewritable DICOM Compliant Magneto Optical Disk. Fujitsu 3.5" 1.3GB External USB MO Super Drive. Reads & Writes 128MB through 1.3GB. Sony 5.25" 2.3 GB 512 sector rewritable DICOM Compliant Magneto Optical Disk. Philips 4.7 GB, 1-4X, 120 minute DVD+RW in slim-line jewel case. Mitsubishi 3.5" 1.3 GB 2048 sector rewritable DICOM Compliant Magneto Optical Disk.